These two postcards were acquired several years ago, but it was only recently that they could be put into context. The following item appeared in the Loughborough Echo on 1st October 1915, and refers to the event where these photographs were taken. With the commendable object of raising funds to provide Christmas presents for the lads from the village serving with the Imperial Forces, a fancy dress parade and dance was arranged, and took place on Saturday last. The weather was fine, and a good number took part in the parade. Assembling at the Village Hall, and headed by the Barrow Brass Band, the procession marched through the streets of the village, and a large number of collectors were busily employed gathering in the contributions from the spectators. At various centres of the village crowds assembled to watch the procession, and much amusement was caused by the original costumes of some of the participants. Amongst some of the feature of the procession would be noticed references to the local circumstances. Leading the procession was the huntsman, then followed a banner, on which was inscribed “Now then Quorn. Do your best”. Some very fine tableaux were to be seen on a number of vehicles. Chief amongst these was one “Home sweet Home”, representing a room of a cottage with the happy couple; of course Tommy was one of the happy couple. Another was a Japanese scene. The Allies, Faith, Hope and Charity, Pierrotts, Old Times – all worthy of praise for the taste and trouble expended upon them. The humorous side were there, The Rag-time Band coming in for special notice. Rags and Bones, Weary Willie, and a number of similar characters. 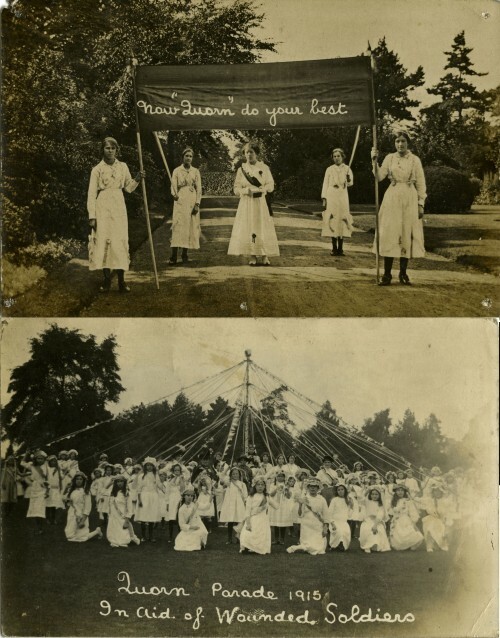 A very pleasing feature was a large Maypole, surrounded by a large number of children, suitably attired for the occasion. The Quorn troop of B.P. Scouts, with their bugle band, took part in the procession. In the evening, to the strains of the band, dancing took place in the Village Hall, and this likewise attracted a large number. The whole effort was a huge success, and about £105 has been realised. The promoters are to be congratulated upon such a fine result, and no doubt when the time comes, many a Quorn lad will thank his friends at home for their generosity.